What is Hurt Locker director Kathryn Bigelow’s height? Who is George Clooney’s arm candy? Why is Jeff Bridges’ Oscar acceptance speech so trippy? Those were some of the questions Googlers wanted answered last night, according to Google’s results for hot trends in searches during the Academy Awards broadcast. Google keeps a close eye on which keywords their users searching for so web traffic obsessives, and advertisers, know what is capturing America’s minds. So what were the results for Sunday night? 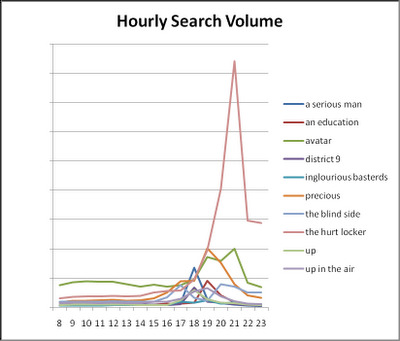 Avatar was one of the most-Googled movies before the broadcast. But curious searchers started wondering what all The Hurt Locker hype was about as the film gathered more Oscar statuettes during the evening. Check out the chart below. Molly Ringwald and Matthew Broderick‘s John Hughes tribute triggered a flood of nostalgia; Sixteen Candles, The Breakfast Club, Ferris Bueller’s Day Off and Home Alone all saw huge query spikes as well. During the memorial portion of the show, queries surged for those in the industry who passed away in the last year, including Ron Silver, Natasha Richardson, Patrick Swayze and Brittany Murphy. On a lighter note, Sandra Bullock set off a frenetic amount of searches when she mentioned a Meryl Streep kiss in her acceptance speech. As for that last tidbit, Sandra was talking about the Critics Choice Awards in January. Both ladies won for best actress. Meryl got up and accepted her prize. Then Sandra’s name was called, she mocked anger and yelled, ‘This is bullsh–!’ Then she grabbed Streep’s face and planted an open-mouth kiss on her.